I wanted to share with you, these photo’s which were taken by my lovely daughter-in-law, Amanda, when we visited the UK with the family a few years ago. 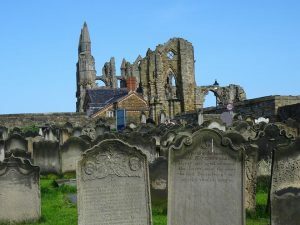 Whitby Abbey is a seaside town in Yorkshire, Northern England, split by the River Esk and is perched on the clifftop overlooking the North Sea. 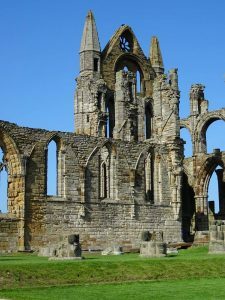 Not only was Whitby Abbey, Bram Stoker’s inspiration for Dracula, it was my inspiration for Roxbrough Abbey, which features in the ‘Oric’ trilogy. The ancient town of Whitby, originally known as Streoneshalh, was the site of an Anglo-Saxon monastery from AD 657. 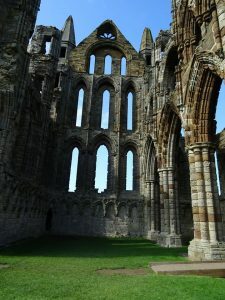 Whitby Abbey was a 7th-century Christian monastery that later became a Benedictine abbey. 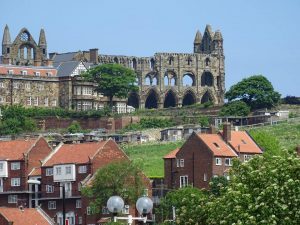 The abbey and its possessions were confiscated by the crown under Henry VIII during the Dissolution of the Monasteries between 1536 and 1545.